The little boy sat on the curb, his mind blown by a new highly addictive street drug. He used to play on the soccer field with his friends after school, stretching practice as long as he could before dinner. Just eight years old, his love of athletics had disappeared, along with many friendships when he began using “pasta base,” a byproduct of cocaine processing. The Chilean Ministry of Education was among the groups that began working with the U.S. Embassy in Santiago to identify solutions. 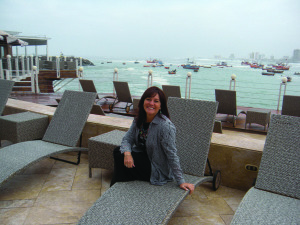 The collaboration resulted in an invitation for a delegation from the United States to visit Chile in 2012. During the visit, three U.S. experts representing various programs designed to decrease and prevent drug use among children met with Chilean government officials and teachers. Presentations were made in cities including Iquique, Rancagua, Santiago, and Valparaiso. 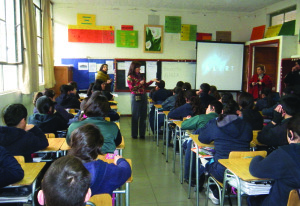 Earlier this year the United States Embassy notified Dr. Luna that officials, impressed by her presentation, had selected Project ALERT to be taught in public schools throughout Chile. In addition to working as a master trainer for the program, Dr. Luna worked with the RAND Corporation, a nonprofit, to develop the two-year, school-based program. “Project ALERT lessons and support materials are made available online at no cost. So the primary cost will be the actual in-person training of the teachers,” she says. The program provides relevant information and motivation and teaches skills to kids so they can resist the pressures to use drugs. Until her visit, there is much to keep Dr. Luna busy. She owns a consulting business, working with individuals and communities to promote health and well-being, and is a Governing Council member for the American Public Health Association, the largest association of public health professionals in the world.